For me, what began as a childhood pastime has emerged into a life-shaping dream. 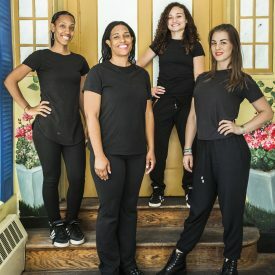 As a young girl growing up in Newark, New Jersey, step dance was my main form of self-expression in a neighborhood with limited options and outlets. Too young to even be fully aware of the power I was tapping into at the time, step was the language I used to build a community for myself and it was my first access into the world of the performing arts. As a child I did not go to the theater often or have an opportunity to see stories on stage that I could relate to. It was not until I saw tap dance legend and fellow Newark native Savion Glover in his Broadway show Bring in ‘Da Noise, Bring in ‘Da Funk that I experienced the power of the black oral storytelling tradition. I felt empowered and encouraged to know that African-American cultural stories could, in fact, have a special place in American theater. I felt even more empowered to know that those stories were being told by someone like me. 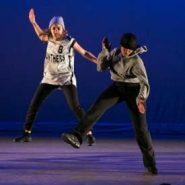 Just as I was inspired by the thrilling magic of Savion Glover, I am now committed, through Soul Steps, to paving a path for other young people to see themselves represented on stage and to encourage them to have the strength to tell their own stories. Through our performances we feature the personal and cultural stories of Soul Steps artists and the communities they represent. We invite audiences to join us in the process of celebration and self-discovery that are birthed through the dance. Step is built on the tradition of exchange and the audience is an integral part of the performance. 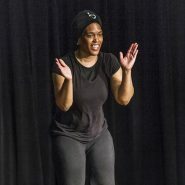 Audience members are invited to engage both vocally and physically with the action on stage, giving energy to the dance and ensuring that no two performances are ever the same. For those of you who are familiar with the art of step, we hope to broaden your perceptions regarding the dynamics of this art form and we welcome you home to the fellowship of performers who share a passion for this craft. To those who will experience their first steps with us, we say join us on this journey, it’s been a long time coming. Electric and also joyous...shines in floor-skimming speed, percussive embroidery. The students were so engaged with the Soul Steps program, it would be very hard to top! !